Human ingenuity knows no boundaries, especially not when it comes to gaming. Despite having access to eight generations of perfectly good consoles designed specifically to play video games, intrepid, tech-savvy gamers can’t seem to stop modding everything with a chip and a screen to play video games. There’s a difference between mini-computers/ad hoc consoles — it’s amazing what you can build with a Raspberry Pi — and running games on something that was never intended for that purpose. So this list won’t have anything like that — just the original hardware and software, hacked to run games. Side note: you’ll notice most of these devices have been modded to play Doom specifically. This is because Doom‘s source code has been available for public use for 20 years. That’s not to say they can only run Doom — but it’s more impressive to watch the gory grandaddy of first-person shooters on a miniature screen than it would be to see, for example, Pong. These are the weirdest things people have modded or hacked to play games on. As revealed by Motherboard, someone hacked a TS100 soldering iron pencil to play Tetris. The real estate is miniscule at 5.5.mm by 2.5 mm, but it’s got two buttons and a screen, so by gosh, we will play some Russian block puzzles on it. The soldering iron heats up every time you lose, making it simultaneously the tiniest and riskiest Tetris game you’ll ever play. 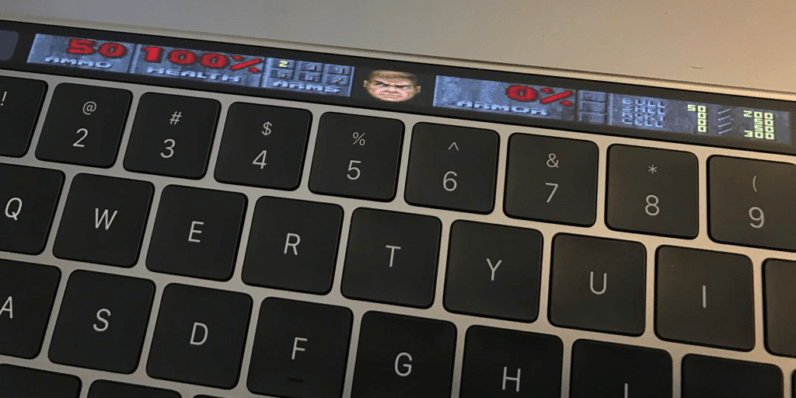 Speaking of something that doesn’t have a lot of screen real estate — the narrow Touch Bar isn’t an ideal place to play a gory first-person shooter like Doom, but it can be done. As Bryan Clark pointed out when he first saw it, it’s playable, only just. At least it won’t heat up like a soldering iron. Out of all the non-consoles hacked to play Doom, a car looks by far the most dangerous to actually play. YouTuber vexal demonstrates how to run Doom on a Porsche Cabriolet’s smart display screen, using the car’s wheel and gearbox as a controllers. Unless you have access to a street layout exactly similar to the layout of Doom‘s levels, it’ll be difficult to play — though if you do, let me know. I want to move there. If you ever get the urge to use some other piece of office hardware to play a game, then look no further than the Canon Pixma Inkjet printer. This was actually done for a practical reason: it was intended to demonstrate a security flaw in the Pixma’s firmware. But it still shouldn’t surprise anyone that, when security researcher Michael Jordon had the chance to use any software in the world to point out the flaw, he chose to use Doom.